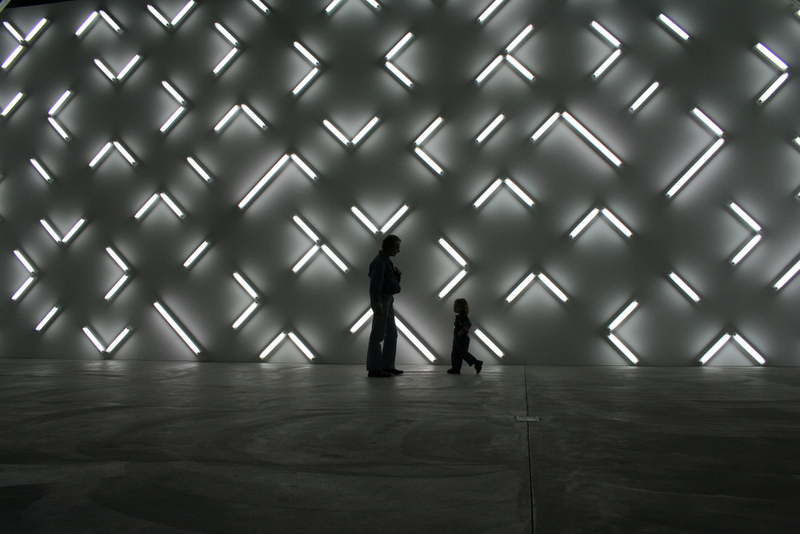 Robert Irwin at Pace Gallery. “Red Drawing, White Drawing, Black Painting.” 2009. Source. How do we define physical interaction? According to Chris Crawford, interaction is a cyclic process that requires two actors, human or otherwise, who alternately listen, think, and speak. In this way, physical interaction can be considered a kind of two-way conversation. Interactivity, he argues, is a deliberate behavior in animals that developed millions of years ago in order to help humans better retain information about their environment. Crawford is quick to clarify that not every encounter is interactive, however. For instance, reading a book is participatory, not interactive, because it is a one-sided communication. While this definition might seem fairly straightforward, many designers contend that it might be too narrow. In his piece “A Brief Rant on the Future of Interactive Design,” Bret Victor suggests that many interactive designers are too quick to abandon the tactile in favor of the visual. Victor argues that our interaction with everyday objects can be considered interactive because they offer us physical feedback. Holding a cup of water, for example, is a tactile form of physical interaction that gives us more information than interacting with an app on an iPhone. I tend to align myself more closely with Victor’s definition of interactivity – after all, we are constantly receiving physical feedback from our environment that engage all of our senses, not just our vision. I don’t think designers should be so quick to dismiss all these other types of encounters as forms of physical interaction. What is good physical interaction? Regardless of how you choose to define interactivity, good physical interaction needs to be intuitive, engaging the various “languages” that humans already use to interact with the world, whether that be auditory, visual, or kinesthetic. A good interactive designer aims to minimize the memory load and the amount of mental effort humans need to put into the interaction. In his book, Crawford argues that interactivity engages the mind more powerfully than any other form of expression. Research seems to back this assertion, as it’s been proven that interactive classroom environments help students better retain information. What about non-interactive digital technology? Most digital technology is to some degree interactive. However, I agree with Crawford that there are many experiences we have branded as “interactive” that aren’t really two-sided interactions. Reading a Kindle might require the user to swipe, but it’s otherwise pretty non-interactive. Watching a movie in a movie theater or on Netflix doesn’t require much interactivity. In the future, we’ll witness the emergence of new forms of technology that turn what was once a non-interactive experience (for instance, watching a movie) into an interactive, participatory experience. Several films at Sundance last year explored this new form of storytelling, including “The Source (Evolving)” and “I Love Your Work.” I think we’ll continue to see artists deconstruct the interactive/non-interactive binary.